Regardless of how the gold price is doing in any given year, there will always be gold-mining companies looking to unearth the yellow metal. 2017 was a good year for the gold market due to increased geopolitical uncertainty. While some were hoping for larger gains, the gold price did rise approximately 12 percent last year. But what were the top gold-mining companies of 2018? The race isn’t over quite yet, but we do have the winners from last year and that’s a good place to start. 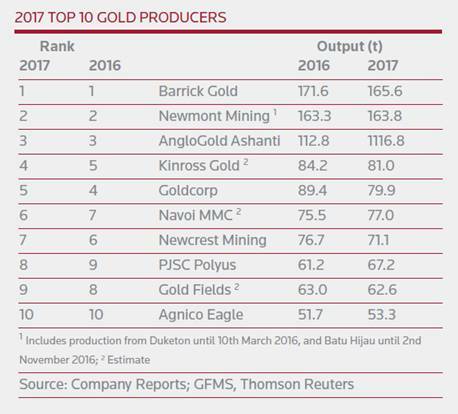 The list below was put together by Dante Aranda, senior mining analyst at Thomson Reuters GFMS, and it shows which companies produced the most gold in 2017. Read on to learn about each of them. Chart via Thomson Reuters GFMS. Barrick Gold took the top spot on last year’s gold-mining companies list despite seeing a slight decline in output from the previous year. The mining company’s output dropped more drastically between 2013 and 2014, when it declined from 222.9 tonnes to 194.4 tonnes. That fall came as Barrick went through structural shifts that led to modifications in production. Those adjustments allowed the industry leader to become more flexible with its finances, but changed its pace of production. The company said in October that its full-year production for 2018 would be at the lower end of its guidance of 4.5 to 5 million ounces. Newmont Mining is another top gold-mining company. It has significant operations in North and South America, as well as Asia, Australia and Africa. Newmont produced 163.8 tonnes of gold in 2017, nearly the same as the year before. In 2017, the company exceeded its expected output and experienced the first full year of production at both the Merian and Long Canyon mines. In October, Newmont narrowed its 2018 production guidance to 4.9 to 5.2 million ounces. Coming in third on this top gold-mining companies list is AngloGold Ashanti, which produced 116.8 tonnes of gold in 2017. That represents a small increase from the 112.8 tonnes it produced in 2016. The South African company has 17 gold operations in nine countries, as well as numerous exploration projects around the world. Its Obuasi and Iduapriem mines in Ghana are on care and maintenance. Kinross Gold has projects in Brazil, Chile, Ghana, Mauritania, Russia and the US. In 2016, the company produced 84.2 tonnes of gold — up from the 78.4 tonnes it produced in 2015. In 2017, the company achieved a sixth straight year of meeting or exceeding production and cost guidance. Kinross produced 81 tonnes of gold last year. Kinross said in November that it was on track to produce 2.5 million gold equivalent ounces for 2018 (plus or minus 5 percent). It was also on track to meet cost guidance. The company is one of the world’s fastest-growing senior gold producers, and operates four mines in Canada, three in Mexico and four in Central and South America. Goldcorp’s 2018 gold production is expected to be on par with 2017 output at 2.5 million ounces; it expects to hit 3 million ounces by 2020. While its Q3 output came in lower year-on-year, the company expects it to “improve substantially” in Q4. Navoi Mining and Metallurgical Combinat bumped its production to 77 tonnes of gold in 2017 compared to 75.5 tonnes produced the year before. According to the Uzbekistan-based company, active government support and constant attention from President I.A. Karimov are the primary reasons it has been able to grow into one of the world’s largest gold-producing companies. Newcrest Mining produced 71.1 tonnes of gold in 2017, down from the 76.7 tonnes it produced the previous year. The Australian company operates mines in four countries. According to Newcrest, it has one of the largest group gold ore reserves of any company in the world. With an estimated 69 million ounces of gold ore reserves, its reserve life is approximately 27 years. The company produced 2.3 million ounces of gold in the 12 months leading up to June 2017. 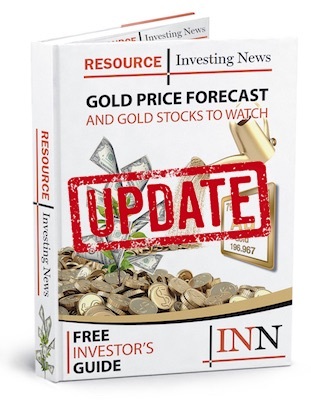 As of September, Newcrest was calling for production of 2.35 to 2.6 million ounces of gold for the 2019 fiscal year, in line with the 2,346,354 ounces produced in the 2018 fiscal year. Polyus Gold International produced 67.2 tonnes of gold in 2017. That’s higher than its 2016 total, which was 61.2 tonnes. The company is the largest gold producer in Russia and holds over 67 million ounces of proven and probable gold reserves. Its principal operations are located in Eastern Siberia and the Far East; those include five operating mines, alluvial operations and several advanced development projects. The firm said in November that it expects its total gold output to range from 2.375 to 2.425 million ounces in 2018. That’s in the upper range of its initial guidance. Gold production for the company in 2017 was expected to be between 2.1 and 2.15 million ounces, but the company exceeded its expectations. On March 29, 2017, Gold Fields entered a 50/50 joint venture with Asanko Gold (TSX:AKG,NYSE:AKG). The joint venture between the two gold-mining companies will give Gold Fields a 50-percent stake in Asanko’s 90-percent-owned Asanko gold mine. Originally Gold Fields was expecting gold production of 2.08 to 2.1 million ounces for 2018; however, as of September it had revised its guidance down to 2 million ounces. “New operations, along with optimizations at existing mines, are expected to result in production growth from current levels to approximately 2.0 million ounces in 2020, along with a decline in unit costs,” Sean Boyd, Agnico Eagle’s CEO, commented in a release from 2017. The Northern Business accounted for 81 percent of the company’s operations, according to its annual report. Check back in 2019 to see which companies make the top 10 gold-mining companies list for 2018. A Russian company-Vasi Lievsky rudnik Gold-Registered in Sudan As Sibrieen. announced an unprecedented discovery in Sudan- it stated that next year it will produce 50000Tons of Gold. and it estimated its reserves as 46000tons!!! SEABRIDGE GOLD is not mentioned? This is 2018 Feb., when are you publishing the top 10 produces again/? I’m looking for 3 major mining companies to express an interest in a long term gold mining project in Ghana. Hi .. i need Informations from smaller African Gold Mines … to invest there and help export to Europe. Do you have Contacts there ?? I will be interested if I can be connected to any legitimate and reliable mining company to invest on a family large gold site. Looking for a gold mine company interested in working a large family land located in Guerrero Mexico.